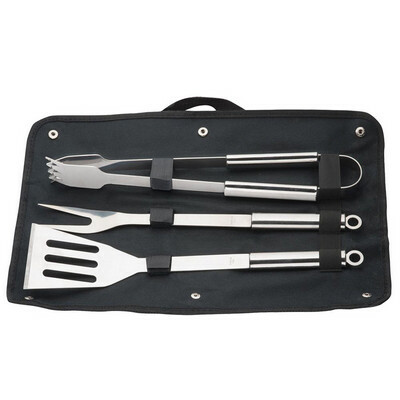 Description: 3pcs Stainless steel BBQ utensils supplied with black 600D woven polyester carry bag. Features: Includes spatula, fork and tongs Packaging: Carry bag has is presented in a white tuck box with the utensils are packed in individual polybags. Box size: 430mm(w) x 105mm(h) x 57mm(d) Colour: Black. Material: Polyester Product Size: 420mm(w) x 280mm(h) Freight details : 20 per carton, 13kgs, 53 x 44.8 x 24.8cms; Decoration Type(s): Colour Print / Full Colour Print / Laser Engrave Decoration Area: Screen: 120mm(w) x 180mm(h). Price includes : Engraved 1 Position. Setup is included.